Adalbert is a forum for me, to post ephemera, photography, poetry, occasional travel notes, and various spontaneous motions. Cover photo: Parsonage where my great-grandfather spent his early years. Taken near Liegnitz, Silesia, ca. 1870. 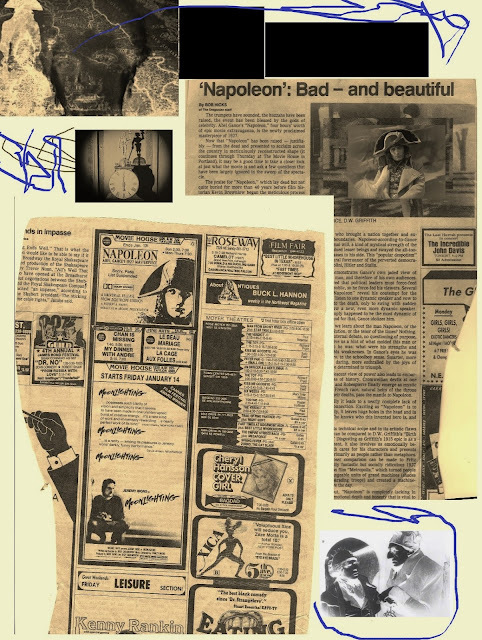 A digital collage I made, based on a cutting with a review (by Bob Hicks) from The Oregonian, of a reissue of Abel Gance's silent film Napoleon (1927), and other elements. I attended the film with the family, at the long-defunct Movie House theatre in Portland, Oregon. Based on the profusion in the ads of films from 1981 and 1982, this event must have been in 1982 or 83. I could stand to see the film again; the triptych sequence at the end, and dizzying camera work throughout were intense. Copyright 2008-19 All Rights Reserved. Simple theme. Powered by Blogger.